New Zealand is known for being an especially verdant country and Auckland is close to a number of spacious parks and nature reserves. 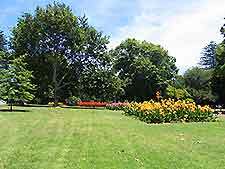 Visitors to the city often choose to pay a visit to the Regional Botanic Gardens, located just off the Auckland-Hamilton Motorway. These gardens opened as recently as 1982 and are now called home by in excess of 10,000 individual plants, with annual visitor numbers always topping half a million. Sited within the Grafton suburb, the Auckland Domain is an especially important local park and is actually the city's oldest, being based around an ancient volcanic crater. The Domain's pair of tropical glasshouses are major highlights here and contain some notable collections of exotics and floral attractions. Elsewhere, highlights include the Mount Eden Domain, One Tree Hill (Maungakiekie), the Parnell Rose Gardens, the Tohuna Torea Nature Reserve and the centrally located Victoria Park, which lies next to busy Fanshawe Street and is just a stroll away from the Viaduct Basin. The Regional Botanic Gardens can be found on the far south-eastern side of Auckland, next to Manurewa East, Goodwood Heights and Totara Park. Home to a wealth of native plants, the grounds cover an area of just over 150 acres / 60 hectares and come with mature trees and shrubs, important collections of exotic plants, peaceful picnic spots and seating areas, pathways, colourful flower borders and an impressive fountain. Located right in the city centre and next to the campus of Auckland University is Albert Park, a large parkland with many open expanses of grass, together with landscaped gardens, a bandstand, statues and seating areas. Various attractions are just a stroll away, such as the Science Centre, the Old Government House, the Clock Tower and the George Fraser Gallery. The Auckland Domain resides within the city centre and is one of the city's most popular public parks. Dating back to the mid-19th century, the Domain is situated right next to the City Hospital and contains many attractions, including the Wintergardens (see below), outdoor sports facilities, sculptures and mature planting, as well as the War Memorial Museum on Cenotaph Road and two separate blocks of tennis courts. During the course of the year, a number of the city's largest events are staged here. The magnificent Wintergardens are situated in the heart of the city centre, alongside the duck ponds of the Domain, where there are many impressive specimens and landscaped planting. Specific attractions include a large glass house overflowing with tropical plants, imaginative planting schemes, a fernery, seating areas and a café, with scenic views of the grounds. 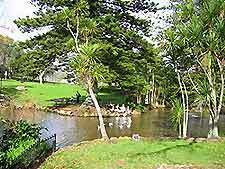 Adjoining the One Tree Hill Domain and the Alexandra Park Raceway, Cornwall Park is sited on the south-eastern side of central Auckland and this large public parkland was created in the early part of the 20th century. As well as various pathways, a visitors' centre and a café, look out for Acacia Cottage, which remains one of the city's oldest timber buildings and was constructed in 1841. Interestingly, Acacia Cottage was actually built on Shortland Street, being relocated twice in its life, ending up on this spot in 1956. 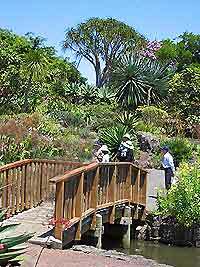 Sited within the Mount Eden Domain, Eden Gardens is to be found on the southern side of the city and features a wonderful collection of mature trees, shrubs and flowers. Notable highlights include colourful planting, benches and a café, while nearby you may like to check out the Withiel Thomas Park, Badminton Hall and Government House. Grey Lynn Park is the perfect space for families visiting the city, with many playground areas, open expanses of grass and outside activities for children of all ages. Located on the south-western side of the city, Grey Lynn is sandwiched by Williamson Avenue and Richmond Road, and is just a few blocks to the north of the Arch Hill Scenic Reserve. Kauri Point Centennial Park can be found on the North Shore, next to Waitemata Harbour, where it provides an important area of green within the suburb of Chatswood. Attractions include large amounts of native plants and wildlife, sandstone cliffs and magnificent views of the Auckland Harbour Bridge, as well as a small cove with an extremely private beach. 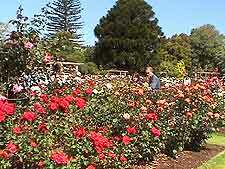 The Parnell Rose Gardens contain an enormous collection of roses in formal beds, including fragrant old-fashioned varieties, standards and modern hybrid roses. Flowering from late spring to autumn, the roses are obviously the main attraction here and are often very fragrant, although there are many mature trees and shaded seating areas. Just down the road is Teal Park, along with the Parnell Baths, the Martyn Fields Reserve and Judges Bay, with a small sandy beach being enclosed by Tamaki Drive. Located on the eastern side of the city and right next to Half Moon Bay, the Tohuna Torea Nature Reserve contains large expanses of scrubland, full of local flora and fauna. With stunning views of imposing Mount Wellington, walking trails and plenty of things to see and do, the reserve is not to be missed. 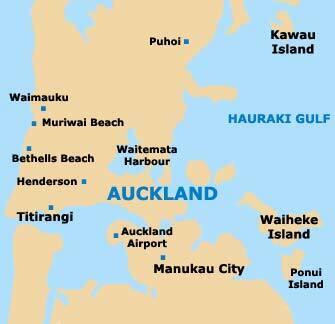 Nearby, you may also like to pay a visit to the nature reserves of Point England and Wai-otaiki, both of which lie just a short distance to the south, being off Taniwha Street. Situated right in the city centre, Victoria Park is bisected by the Auckland-Hamilton Motorway and lies alongside St. Marys Bay. Visitors will find a number of popular sporting facilities, large playing fields and a nearby playground area for children. If you are in the mood for a picnic lunch, then a branch of the New World Supermarket is conveniently based next door.